Clear up acne and acne scars for the beautiful skin you deserve. We offer a variety of customized options that can help beat acne and erase acne scars. 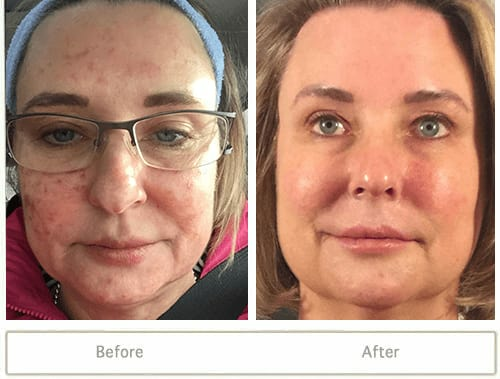 Prescribed by physicians, this effective and easy to use at-home system should be used daily to achieve the results you want, from erasing wrinkles and hyperpigmentation to eliminating acne and tightening the pores. It is formulated with medical grade ingredients and available only at physician-directed clinics, like Skin Vitality Medical Clinic. This is a flexible skincare regimen that is easy to follow for use at home and can be used by all skin types and shades. Fraxel Skin Resurfacing is a non-ablative laser system that boosts collagen production to promote cell renewal for healthier, stronger skin. The treatment can minimize the scarring left by acne breakouts. Any skin type can be treated. Reduce the size of your pores. Minimize the appearance of age spots and /or other types of hyperpigmentation. Enhance moisture retention, making the skin smoother and more supple. 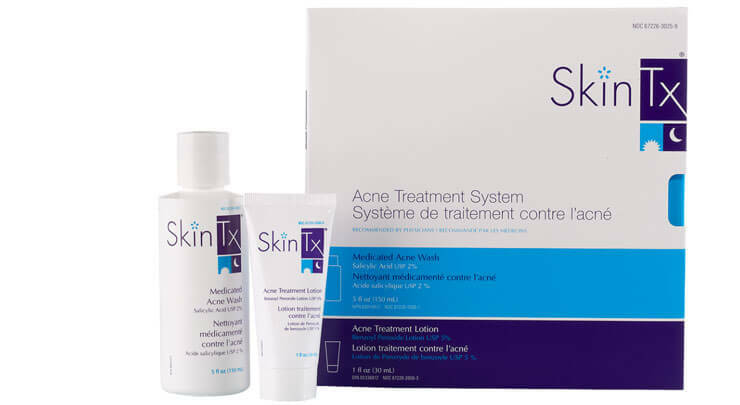 SkinTx™ understands that the skin’s restoration relies on three crucial phases. The length of each is determined by your custom tailored skin treatment program as prescribed by your medical skin care specialist or physician at Skin Vitality. These three phases of restoration result in the optimal renewal of your skin. Speak to one of our medical consultants to obtain the right course of treatment for you. Acne is an extremely common and unpleasant problem. Most of us have or will suffer from this condition but, surprisingly, not many of us actually understand either what it is or how it develops. Acne is a skin condition that involves overactive oil/sebaceous glands. Our body always produces oil (or sebum) in a natural process that serves to provide moisture and lubrication for our skin but when the glands are unable to regulate this production problems can occur. The most common of these problems is the development of acne. Overproduced oil can easily become trapped in our skin’s oil ducts along with shed skin cells and this blockage leads to common forms of acne like pimples (small, often pus-filled swellings), blackheads (dark skin marks containing a mixture of blocked skin cells and accumulated oil), cysts (pockets of semisolid matter and fluid that has become trapped beneath the skin) and whiteheads (white or flesh-coloured, pus-filled bumps). Almost all areas of our skin can develop pimples but it most commonly occurs where the highest number of oil glands are located (the chest, shoulders, back and face). The cause for acne is, unfortunately, an extremely common one that effects nearly everyone at one time or another in their lives. Androgen hormones (produced by our adrenal glands) cause oil glands to enlarge, producing more of the substance than is necessary. This leads to the pores being unable to naturally filter this excess to the skin’s surface. Once the pores have been blocked shed skin cells (from pore linings) are unable to be disposed of through natural processes. These cells form a blockage that combines with the oil to create acne. What are the Risk Factors for Acne? Unfortunately everyone is susceptible to developing pimples and zits. It most commonly develops around puberty and lasts for three to four years after first appearance (in some cases, however, acne can continue for eight to twelve years). Acne is usually considered to be a teenage phenomenon (because of the hormonal changes that lead to excessive oil production during this time) but it can also effect people of different ages as well. Because hormones play such a large role in oil production, fluctuations in hormonal levels can cause acne to develop at different times. Researchers have found a link between menstruation and acne flare-ups with women for instance. The development of severe breakouts is experienced mostly by men due to the fact that men naturally produce more androgen. Both of these causes lead to breakouts. Acne scarring is always troubling. After having to deal with the problem of pimples themselves none of us want to confront unsightly scars as well. All types of wounds leave scars — even the extremely minor wounds that acne inflicts upon the skin. Our bodies interpret the development of acne as a type of injury and the natural role of the immune system is to respond to any skin wound by repairing it. Often, this reparative process results in the creation of new tissue that doesn’t look or function quite as well as the original skin. This is scar tissue and is responsible for the look of most forms of acne scars. Apart from the role of natural processes, scars can also be exacerbated by an acne sufferer’s actions. Picking or popping pimples allows any bacteria contained within the acne to re-enter the body. Just as we take lengths to make sure that no bacteria is able to live inside a cut — or any other type of skin wound —we are also meant to be careful about infecting even a minor acne injury. Once bacteria has been allowed to re-enter the skin, it can become trapped in the dermis layer (underneath the exterior of our skin) and this makes it even harder for proper healing. To occur. All scars, regardless of their form, are cause by the body attempting to repair tissue damage. There are a few different types worth understanding however. Hypertrophic (otherwise known as Keloid) scars are raised and smooth. These scars can become large but, luckily, they often decrease with time. Box car scars look like chicken pox scars and are defined by an angular shape (usually found on the cheeks or near the temples). Ice pick scars are deep and leave pits in the skin that often resemble indentations. Rolling scars are usually wide and shallow and longer than other types of scars. There are many different ways that scarring can be prevented or minimized. The most important step is leaving acne alone to heal by itself. The majority of acne scarring is brought on by the condition being aggravated. Don’t unnecessarily touch, pick or pop pimple. Making use of gentle cleansers and topical solutions is another good idea. There are a wide range of over the counter products that work well but a dermatologist or family physician can also prescribe medications containing salicylic acid or benzoyl peroxide for optimal results. Medical treatments are a good plan for severe acne or acne scarring as well. Laser skin procedures and medical grade chemical peels both provide help for sufferers in need of more intensive therapeutic plans.